(Nanowerk News) Interest in ‘green’ innovation means not just thinking big but also very, very, very small. At least that’s the way Omowunmi Sadik, director of Binghamton University’s Center for Advanced Sensors and Environmental Systems, sees it. She’s working to develop sensors that would detect and identify engineered nanoparticles. Her research will advance our understanding of the risks associated with the environmental release and transformation of these particles. 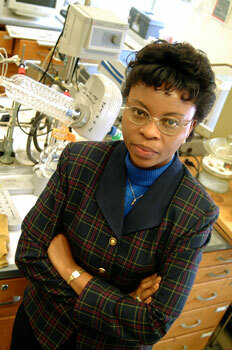 Omowunmi Sadik, director of Binghamton University’s Center for Advanced Sensors and Environmental Systems, is developing sensors that would detect and identify engineered nanoparticles. A survey by the Project on Emerging Nanotechnologies found that nanoparticles — particles less than 100 nanometers in size — are now used in more than 1,000 consumer products ranging from cars to food. Silver nanoparticles are widely used as coating materials in cookware and tableware and as ingredients in laundry liquids and clothes because of their antibacterial properties. You can even buy socks infused with silver nanoparticles designed to reduce bacteria and odor. Little is known about how these and other engineered nanoparticles interact with our water systems, the soil and the air. Some are known toxins; others have properties similar to asbestos. And it’s difficult, if not downright impossible, to monitor them. Current techniques rely on huge microscopes to identify nanoparticles, but the devices are not portable and do not provide information about the toxicity of materials. Sadik and a Binghamton colleague, Howard Wang, have received funding from the Environmental Protection Agency to design, create and test sensors for monitoring engineered nanoparticles and naturally occurring cell particles. “We need to understand the chemical transformation of these materials in the ecosystem so we can take action to prevent unnecessary exposure,” Sadik said. Her lab has already created a membrane that will not only trap a single nanoparticle but also provide a means of signal generation. It uses cyclodextrin, whose molecular structure resembles a tiny cup. “It can be used not only as a sensor, but also for cleanup,” Sadik said. That discovery and others make Sadik believe that nanotechnology may also prove useful in the remediation of environmental pollutants. Green nanotechnology could even reduce the use of solvents and result in manufacturing protocols that produce less waste, she said. For instance, Sadik has used nanoparticles to transform Chromium 6, a known carcinogen, into Chromium 3, which is benign. “I do see the positive side of it,” she said.